A few flakes are falling in the Wasatch, and the powder hounds are lining up at the base of Little Cottonwood Canyon to hitch a ride up to the resorts. Their thumbs flagging a ride are a sign that they are not suffering skiers thumb. …yet. Skiers Thumb is a strain or rupture of the ulnar collateral ligament of the thumb. It causes pain and swelling in the web of the hand between the base of the thumb and index finger, and it makes it difficult to grip or fully extend the thumb. 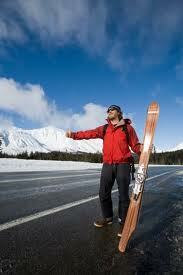 The injury usually occurs when a skier falls on an open palm with the ski pole still in the hand. The pole, on impact, forces the thumb to the dorsum of the hand (non-palm side), overstretching or tearing the ligament. Most skiers know this discomfort. A mild strain of the ligament is quite common and can plague a skier all winter if left untreated. In serious cases where after a fall the thumb swells, becomes painful to move, may bruise, and/or becomes more painful over the next few days, it is best to have a sports medicine doctor or orthopedist evaluate the injury. Typical treatment involves immobilization of the thumb for 4-6 weeks, but you can usually sweet talk your doctor into a cast where a ski pole can fit so you can still ski. However, surgery is occasionally required to repair the ligament. In mild cases where the thumb is merely sore and quickly improves, self-care can help heal the injury so it does not hurt all ski season. For the first few days after any mild strain you should ice the area several times a day, reduce motion with an ace bandage or over the counter splint, and protect it from a repeat blow, meaning that skiing is not a good idea. After 3-5 days of gently care for your thumb, you can start performing exercises to help heal the ligament. Thumb active range of motion: With your palm flat on a smooth surface, move your thumb away from your hand as far you can. Hold this position for 5 seconds and bring it back to the starting position. Next, rest your hand on the table in a handshake position. Move your thumb out to the side away from your palm as far as possible. Hold for 5 seconds. Return to the starting position. Next, bring your thumb across your palm toward your little finger. Hold this position for 5 seconds. Return to the starting position. Three pain free sets of ten are recommended. Pain is a sign that you are re-tearing tissue! Flexion: Gently bend your wrist forward with an open hand then curl the fingers into a fist. Hold for 5 seconds. Extension: Gently bend your wrist backward, straitening the fingers as you extend the hand. Hold this position 5 seconds. Side to side: Gently move your wrist from side to side in a beauty queen wave motion. Hold for 5 seconds at each end. After a few days of performing these range-of-motion exercises, normal motion should be restored. If not, see a doctor. Otherwise, you are ready to start strength training. Thumb strengthening: Pick up small objects such as pennies between your thumb and each of your other fingers. Practice this exercise for about 5 minutes. Finger spring: Place a large rubber band around the outside of your thumb and the fingers. Open your fingers to stretch the rubber band. Do three sets of 10. Grip strengthening: Squeeze a tennis ball and hold for 5 seconds. Do three sets of 10. Wrist flexion: Hold a light weight or soup can in your hand with your palm facing up. Bend your wrist upward. Slowly lower the weight and return to the starting position. Do three sets of 10. Gradually increase the weight. If your Skiers Thumb injury is mild and you take care of the injury you should be back to skiing pain-free in about two weeks. Within this time frame you should also be able to fully extend your thumb and catch a friendly ride up the canyon. Happy Skiing! This entry was posted in hand and wrist, Sports Injuries and tagged skiers thumb, skiing injury, ulnar collateral ligament by focusbodywork. Bookmark the permalink.